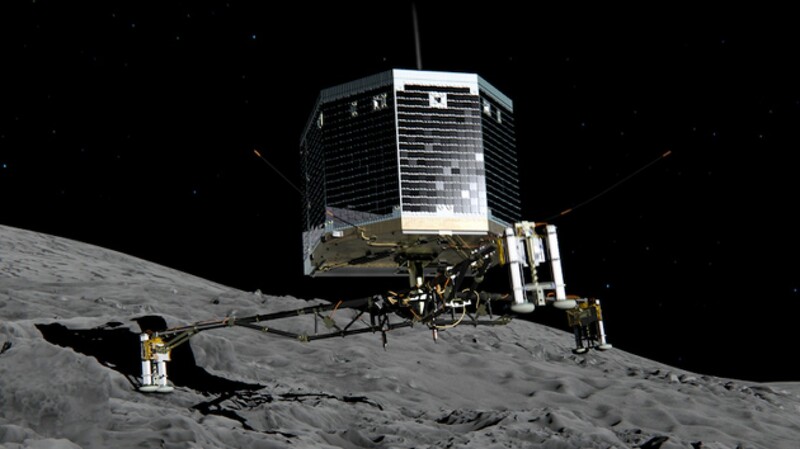 ESA – Scientists at European Space Agency has decided exactly where it is going to attempt to land a robot called Philae on on comet 67P/Churyumov-Gerasimenko, currently being carried by the space probe Rosetta which is orbiting 67P after a decade-long pursuit. Rosetta’s lander Philae will target Site J, an intriguing region on Comet 67P/Churyumov–Gerasimenko that offers unique scientific potential, with hints of activity nearby, and minimum risk to the lander compared to the other candidate sites.Experts had to find a relatively smooth area on the ‘ice mountain’ (which also happens to be rubber-duck shaped) that would be hospitable to Philae. “As we have seen from recent close-up images, the comet is a beautiful but dramatic world – it is scientifically exciting, but its shape makes it operationally challenging,” says Stephan Ulamec, Philae Lander Manager at the DLR German Aerospace Center. “There are flat areas, but there is also rough terrain. There are some cliffs, there are some boulders. It’s not a perfectly flat area as we probably would have hoped for a safe landing site,” he said. Site J is on the ‘head’ of the comet, an irregular shaped world that is just over 4 kms. across at its widest point. The decision to select Site J as the primary site was unanimous. The backup, Site C, is located on the ‘body’ of the comet. The 100 kg lander is planned to reach the surface on 11 November, where it will perform indepth measurements to characterise the nucleus in situ, in a totally unprecedented way. Over the weekend, the Landing Site Selection Group of engineers and scientists from Philae’s Science, Operations and Navigation Centre at France’s CNES space agency, the Lander Control Centre at DLR, scientists representing the Philae Lander instruments and ESA’s Rosetta team met at CNES, Toulouse, France, to consider the available data and to choose the primary and backup sites.